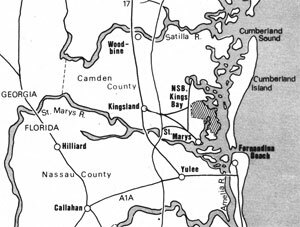 Kings Bay, on the South Atlantic Coast near the Georgia-Florida border, is the site of the Kings Bay Naval Submarine Base. This $1.8-billion project of the U. S. Navy is bringing major economic and social change to a predominantly rural, coastal community. The client, the Kings Bay Impact Coordinating Committee, consisting of elected officials representing Camden County, Georgia and Nassau County, Florida, contracted with Urban Information Associates to prepare a comprehensive economic development and diversification study, with a companion labor market analysis and strategy. The study anticipated the consequences of adding a total of 25,000 new civilian and Navy residents to the host communities through the mid -1990's. The increase in purchasing power, discounted for on-base spending and leakage to the larger Jacksonville, Florida and Brunswick, Georgia markets, was translated into local demand for retail, business and professional services, and estimates of required commercial floor space. Estimates of increased spending related to tourism and recreation were incorporated into development recommendations for the small, historic waterfront towns of St. Mary's, Georgia and Fernandina Beach, Florida. A final component of the project was a labor market analysis and workforce adjustment strategy to accommodate to the anticipated economic changes.